When is an iPad not an iPad? When it’s a TV screen. That distinction is becoming increasingly important as battle lines are being drawn between distributors like Time Warner Cable, (s TWC) which claim the right to broadcast live TV to any screen in the home, and programmers like Viacom (s VIA) and Scripps, (s SNI) that want to get paid for content streamed on different devices. The battle not only underlines the growing importance of devices like the iPad (s AAPL) and other tablets as video consumption devices, but also highlights a rapid shift in the way viewers are consuming content. Time Warner Cable isn’t the only pay TV distributor with an iPad app; Comcast (s CMCSA) has one that allows subscribers to navigate its program guide and watch on-demand videos from channels they subscribe to on the app. Dish Network (s DISH) and Verizon (s VZ) have also been forward-thinking in the mobile space with release of their own apps. But Time Warner Cable’s iPad app does something that no one else does (yet) — it makes live TV channels available, as long as the subscriber is streaming from their own home network. While Verizon and Comcast have both talked about adding live TV streams to their apps, neither has pulled the trigger yet, making Time Warner Cable an interesting test case for how programmers would view such a service. Not surprisingly, they see live TV on the iPad as a new revenue opportunity, and that Time Warner Cable doesn’t have the right to stream to mobile devices over the Internet, even if those streams are confined to the home network. Time Warner Cable, for its part, maintains it has broad rights to distribute its live TV feeds to any screen in the home, whether those streams be delivered via traditional coax or wirelessly to a mobile device. But the bigger point is that viewers are actually using devices like the iPad to consume video more than ever before. In other words, the tablet market is a new screen worth fighting over. LRG Research, for instance, reported that among mobile phone owners, about 15 percent use those devices to watch video at least weekly. That’s a 50-percent increase over last year and more than double the percentage that watched mobile video two years ago. And live video on the iPad and other mobile devices is becoming even more in demand, as can be seen through Turner’s (s TWX) March Madness on Demand (MMOD) service. MMOD, which is streaming all matchups from the NCAA Division I Men’s Basketball Championship tournament live online and on the iPhone and iPad, saw a 60-percent increase in total visits on mobile apps this year. In fact, viewing on the iPhone and iPad accounted for nearly 30 percent of all live streams during the first two weeks of the tournament. But should these new devices mean new rights, new licenses and new viewing windows? In the old world, it was clear that a mobile video service was distinctly different from what a viewer could get on his mobile phone versus his computer versus his big screen TV. 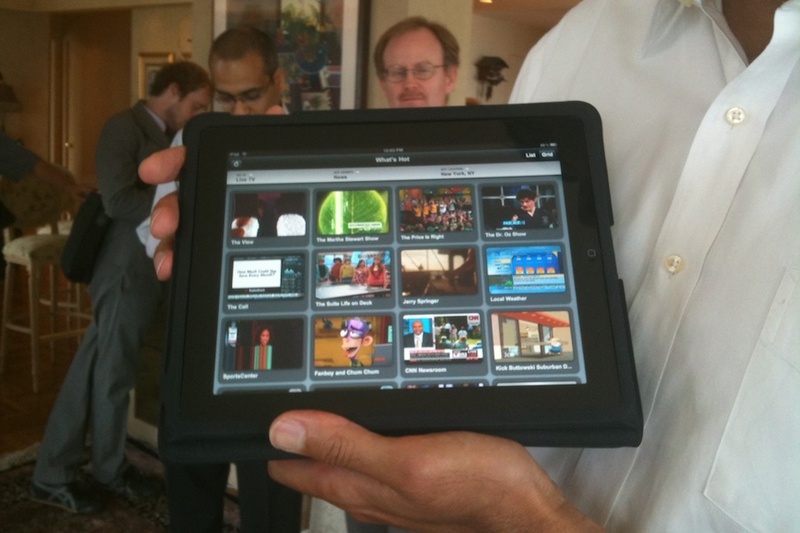 But for the new generation of video viewers, the lines are blurring between devices. To the average consumer, there’s little difference between a 9.7″ iPad versus a laptop or net-top screen, except one is more mobile than another. And while there’s still the appeal of the leanback experience of TV viewing, convenience and mobility are becoming increasingly important to TV watchers. In many ways, Time Warner Cable provides the perfect example of this. The cable company’s iPad app has been downloaded more than 300,000 times since launch, and most viewer complaints so far are about the dearth of programming available for live streaming. With just 32 channels from the cable lineup available, subscribers are asking for more viewing options, and they don’t seem to be particular about using the iPad as a substitute for the TV. While programmers have gotten used to the idea of a different license for each different class of device, today’s consumer doesn’t think about their viewing patterns in the same terms. As the flavor of network and end device that content is delivered become less important, content companies will have to embrace more broadly held digital rights, instead of trying to create new revenue streams out of each new distribution platform. There are still lines at the Apple store near me every morning. However, after speaking with an employee there, it turns out that half of the people in line are simply there (often with family members), to buy the maximum number of iPad2’s and then resell them, and they show up every single morning. In other words, the (local) demand is somewhat inflated by these resellers, and the actual iPad2 buyers are significantly less. As soon as iPad 3 will have Retina Display-like quality, sign me up! My 3.3 year old can navigate our iPod like a pro – can locate & click Netflix & YouTube logos and asks for Apple TV. But, he still needs Dad to type “Scoobie Doo” in the search field! So are sites like http://www.mobiletv.net/ the next Napster of video/tv world and thus soon the target of the legal wrath of broadcasting industry? I remember when the iPad first came out and the iHaters and naysayers were arguing “Who’d want to watch TV on a 9.7″ display when you have a big-screen HDTV in the living room?” I have one of those big-screen TVs, but have always been more than satisfied to watch TV shows on my 15″ MacBook Pro hooked up to my Slingbox and cable DVR. I’m more interested in content than I am size and the convenience of moving my viewing screen anywhere I feel comfortable at the moment. If WiFi were more ubiquitous in NYC (on public transportation), I’d always be watching TV on the go. I think the iPad is a good size and weight for watching TV shows on the go. Please, don’t think there is uniformity between the two major satellite TV providers. DirecTV is miles ahead of DISH. Read the reviews of iPad apps between the two. I expect DirecTV will have a direct-to-iPad feature added to their app within the year. And I’m really looking forward to using it – even if it’s just for something as simple as checking the news while getting something done with the iPad sitting out on the portal of our workshop. Agree with Ryan. I can’t help but think of the DVD. When you bought one, you paid for the movie, not for the ability to watch it on your TV. You could play it using your DVD player connected to your TV, your notebook or on a portable DVD player. Imagine if they charged you for each of these options? Ah, Dire Straights, Sting. Of course, for the metaphor to be complete, someone like Scoble would have to write it as the song that defined the “MTV Generation” (no, I’m not a “generation Xer, tyvm”) was mocking the very thing MTV was celebrating. By all means, programmers, keep kvetching about licensing for mobile devices and game consoles and everything else. And in the meantime, disruptive content is coming from Netflix and online content creators and soon there’ll be no need for any of you. *sigh* It’s sad watching the industry self-destruct because they can’t get a grasp of culture changes. Just like the silent film creators were left behind by the talkies, so traditional television programmers are going to be left behind if they can’t figure this out, and fast. We aren’t going to pay for access to the same content on multiple devices. We are going to pay for an experience that meets our needs.